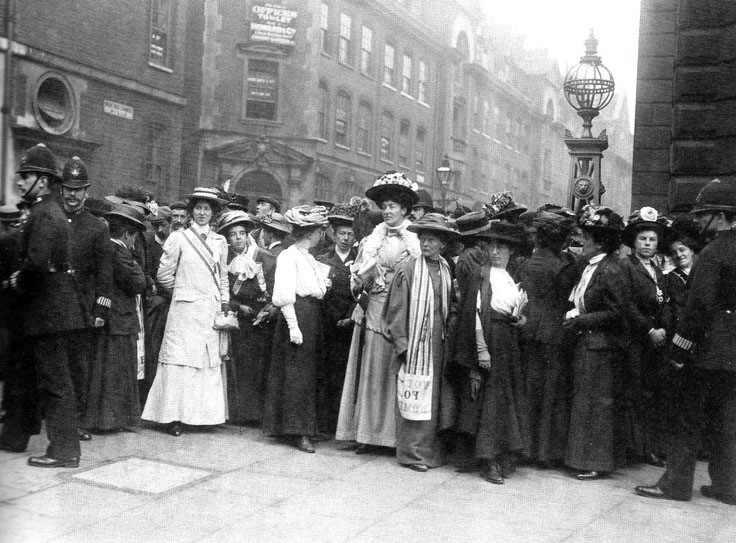 Author and historian Diane Atkinson reveals some of the stories of the women who fought for the vote, and how the British Museum became a target for their efforts. 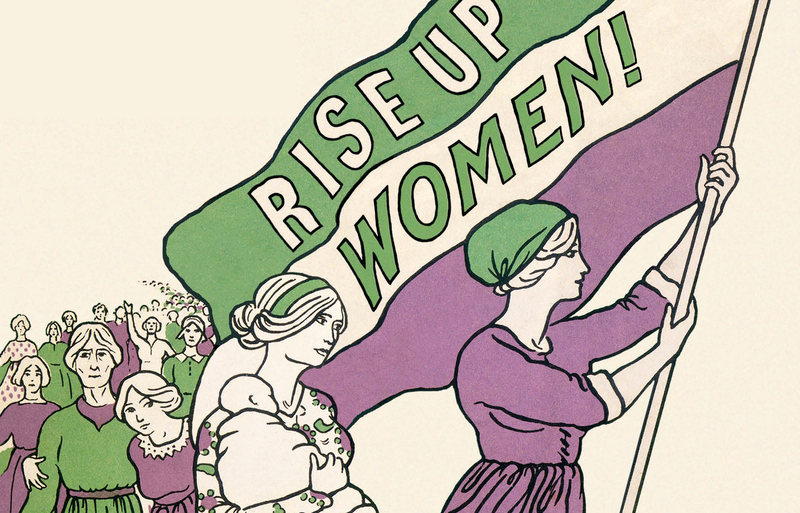 Detail from the cover of Diane Atkinson's book Rise Up, Women! On 6 February 1918, the Representation of the People Act 1918 was passed in the UK, enfranchising women over the age of 30 who met minimum property qualifications. About 8.4 million women gained the vote. It would be a further 10 years until the Representation of the People Act 1928 gave the vote to all women over the age of 21, on the same terms as men. My book Rise Up, Women! The Remarkable Lives of the Suffragettes is a group biography of more than 200 suffragettes, all members of the Women’s Social and Political Union (WSPU), who waged a militant campaign for the vote from 1903 to the outbreak of the war in 1914. The book throws new light on women of all classes, all parts of the country, and many life experiences, who gave their days and years so that women could have the vote, become MPs, have a career, join the professions, make laws. The recent revelations about the lack of equal pay, and sexual harassment across the entire workforce, shows there is still so much work to do before women enjoy full equality with men. Rise Up, Women! brings new faces and new stories to reveal a broader and deeper impression of who these remarkable women were. Members of the WSPU outside the ‘rush trial’ of Emmeline Pankhurst, Christabel Pankhurst and Flora Drummond at Bow Street Magistrates Court in October 1908. Fast forward through the vivid, dangerous, sometimes comic and often painful ten-year suffragette narrative and take a closer look at the spring of 1914, a time of unprecedented vandalism, smashing windows and burning empty houses, sports facilities and churches, and attacks on works of art and museum displays, when the suffragettes were personae non grata throughout the country, deeply disliked by almost everyone, stalked by Special Branch, and often assaulted by members of the public. Male medical students were especially troublesome and would attack these women and smash up their shops and offices. Faced with the intransigence and duplicitous behaviour of the government and the torture of women who went on hunger strike in prison and were fed by force, membership of the Women’s Social and Political Union’s campaign was not for the faint-hearted. SUFFRAGETTES AT THE BRITISH MUSEUM. CASE SMASHED WITH A CHOPPER. 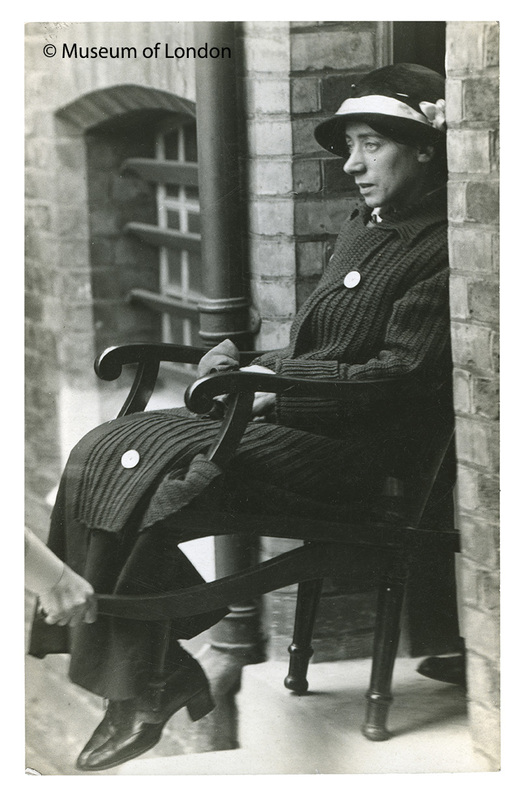 Surveillance photograph of the suffragette prisoner Clara Lambert, taken by an undercover photographer working for the Home Office at Holloway Prison in 1913–1914. 57.57/36. Find out more in Museum of London’s new Votes for Women display. On 9 April 1914 the British Museum was targeted by a woman named as ‘Mary Stuart’, but whose real name was Clara Mary Lambert. She smashed a display case in the Asiatic Saloon and broke three Chinese porcelain cups and a saucer. Dressed in a ‘long tweed costume over which she wore a long coat’ Clara appeared to be studying the antiquities, when ‘she produced a brand new hatchet from beneath her coat and before the attendants could seize her, belaboured the cabinet of porcelain’. At Bow Street Court the next morning Clara ‘in a very excited manner began to shout and declaim’ to the magistrate. She told him she had not come to listen to him, refused to recognise the authority of the court, and told him she would not sit down while Mrs Pankhurst and others were being tortured by the ‘devilish’ work of the Home Secretary, Reginald McKenna. Clara was taken from the court and the case was adjourned until the afternoon, but when she returned she was ‘disorderly and continued speaking loudly’ while two officers held her firmly in the dock. Left: Poster by A Patriot, showing a suffragette prisoner being force fed, 1910. 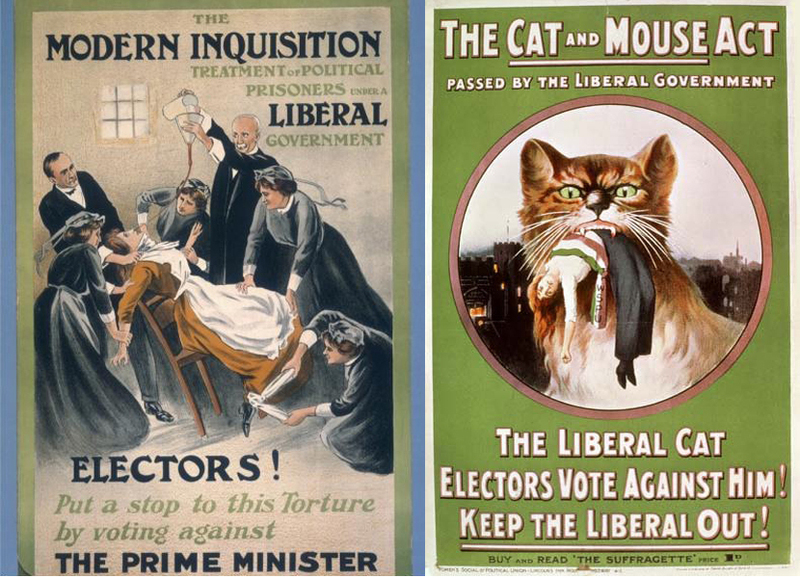 Right: Cat and Mouse Act poster from 1914. 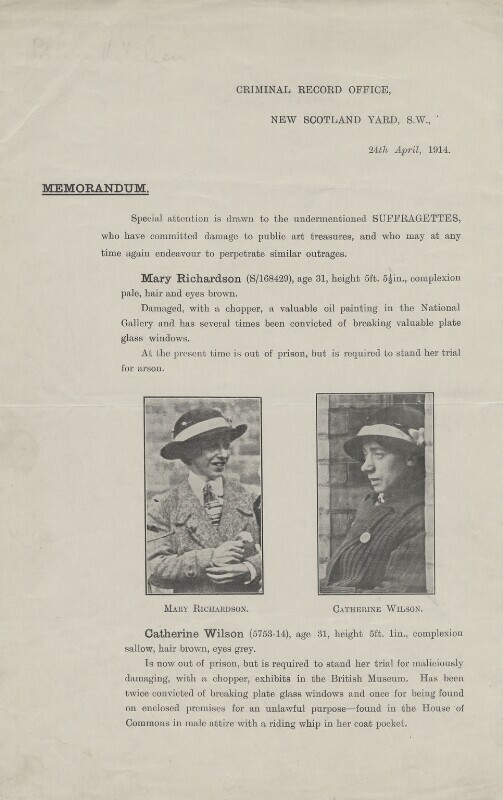 The Scotland Yard memorandum featuring Mary Raleigh Richardson and Clara Mary Lambert (Catherine Wilson) by an unknown photographer. Criminal Record Office memorandum, issued 24 April 1914. NPG x136416. © National Portrait Gallery, London. Clara Lambert came from a working-class background, and was a collar-dresser in the family laundry business in Catford before throwing herself wholeheartedly into the WSPU in 1906. When she was arrested on Black Friday on 18 November 1910 Clara was released without charge. Her hunger strike medal has three silver bars giving the dates of her force feeding in 1912, 1913 and 1914. News of the attack on the mummy case prompted the National Gallery, the Wallace Collection and the Tate Gallery to close their buildings until further notice. The Standard described how American women wishing to visit the National Gallery had to be accompanied by an Embassy secretary. The Tate Gallery and Wallace Collection insisted on a letter of recommendation from public officials such as ambassadors, MPs and judges, accepting ‘all responsibility for the acts of the bearer’. 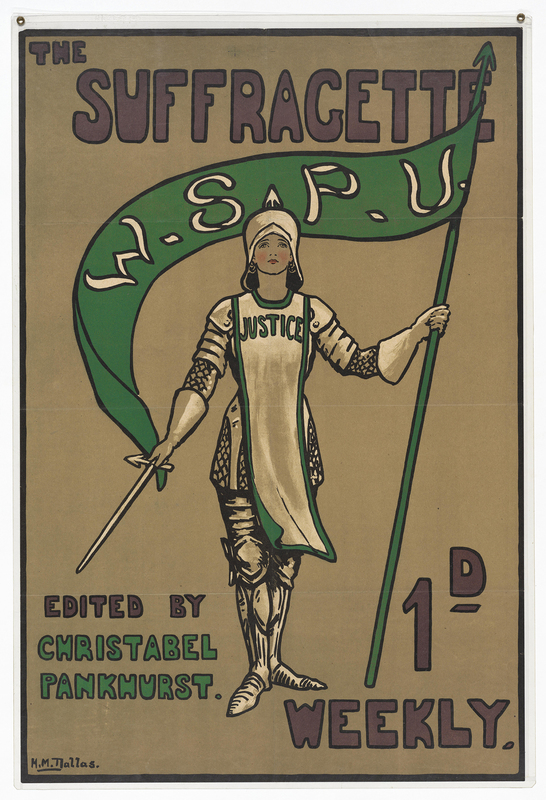 Suffrage poster depicting an issue of the periodical The Suffragette with a figure of a woman Justice clad in armour bearing a banner labelled WSPU. Writing Rise Up, Women! I wanted to know what became of the suffragettes when the militant campaign was suspended at the outbreak of the First World War. I am curious about their ‘afterlives’, what they did during the war when everyone was expected to ‘do their bit’, how they rebuilt broken family ties and how they earned a living. Giving so much of oneself to a dangerous and unpopular political campaign at the height of their powers, it might have proved difficult for the suffragettes to return to a ‘normal’ life and get a job. Clara Lambert lobbied for food rationing during the War, and in 1915 she joined Maud Allen’s Women’s Police Service and was sent to do welfare work with women munition workers in South Wales, and there met her lifelong companion Violet Croxford. Violet had been a nurse at the Manor Asylum in Epsom before war broke out. In the 1920s Clara did rescue work with young girls in London, and in 1926 the couple opened a hostel in Hythe, Kent, for ‘unfortunate ladies.’ Clara died in Surrey, in 1969, aged 94. It has proved impossible to find out any information on Nellie Hay and Annie Wheeler, the mummy case-smashers, or even if these were their real names. Rise Up, Women! The Remarkable Lives of the Suffragettes is published by Bloomsbury Publishing.